On Saturday, men and women across Afghanistan will be heading to the voting booth to cast their ballots for the nation's next president. But for folks living in the some of the most inaccessible villages in the country, the voting booth will be actually heading to them -- by way of donkey. 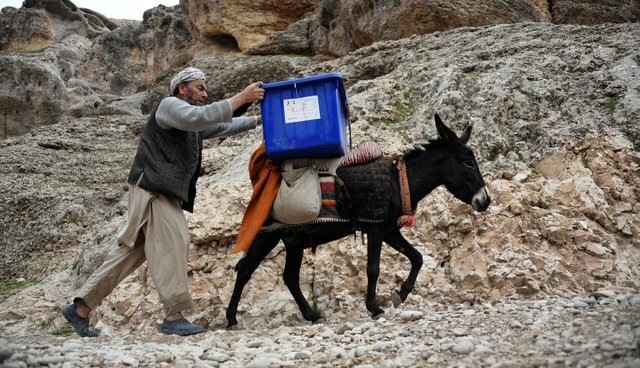 To ensure that all eligible voters will have the chance to participate in the democratic process, Afghan officials have enlisted the help of more than 3,000 donkeys, burros and oxen to transport election materials to some of the harder to reach villages in Afghanistan's more mountainous regions. "We have rented the animals from local villagers and will return them to the owners after the election," election commission spokesman Noor Mohammad Noor tells Radio Liberty. As a growing young democracy still reeling from violence and threats against the new form of governance, the Afghan people are considered by many to be an inspiration in their determination to secure free and fair elections -- a stubborn spirit beautifully embodied by the fleet of animals that are helping to make it all possible.